"These cute, individually sized hams are firm, moist, and perfectly salty. Serve them over the holidays or for your next dinner party." Place celery, onion, and garlic in a blender. Add 2 cups cold water and puree until smooth. Pour celery mixture into kosher salt mixture and stir to combine. Add 1 quart of water, or more as needed, to make a total of 2 quarts of brine. Place pork chops in brine, cover, and refrigerate for 2 days. Combine 1/4 cup brown sugar, Dijon mustard, and cayenne pepper together in a small bowl and set glaze aside. Remove pork chops from brine and pat dry; discard used brine. Cut shallow slits along the sides of each pork chop, about 1/4 inch deep. Cut a crisscross pattern in the top of each pork chop, creating small 1-inch triangles. Heat oil in a large, oven-proof skillet over high heat. Cook chops in the hot oil until browned, about 2 minutes on each side. 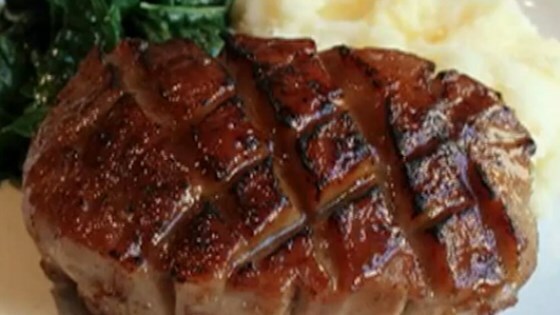 Brush the crisscrossed top of each pork chop with about 1 tablespoon of glaze. Insert 3 whole cloves in the top of each pork chop. Transfer skillet to the preheated oven and roast pork chops until golden brown and slightly pink in the center, 20 to 25 minutes. An instant-read thermometer inserted into the center should read at least 145 degrees F (63 degrees C). Remove pork chops to a plate and discard cloves. Using a small butane hand torch, brown the tops of the pork chops by making short passes over the tops with the flame not quite touching. Make these amazing home-cured, mini-size individual hams for Christmas dinner. If using fine table salt, you'll need barely 1/3 cup. Always brine foods in a food-grade, non reactive container such as a stainless steel or enameled stockpot, a brining bag, or a food-grade plastic bucket. Very good. Everyone loved them, even the kids.